Secret Santa 2010 - The Sign up is OVER + All PMs sent! So once again, it is that time of the year. For those who are not familiar with the Secret Santa, it basically is an anonymous gift exchange activity. As the name suggests, it has a mystery factor: You know who you are giving a gift to, but not who you are receiving it from. Since we are Pixelation and all, we will be dealing with "pixel gifts"
If this activity caught your attention, please read this thread carefully. Only people who signed up before the PM send out will be able to partake in this activity. For signing up, reply on this thread with a message on the lines of "I sign up" or "Count me in". If any message is not clear, it will be ignored. Only sign up if you are 100% sure you can deliver a gift for your partner. If you do not deliver anything by the due date, you will be banned from the forums for a while and won't be able to participate in the next Secret Santa. When signing up, add a few extra bits of info about you, things you like or dislike, hobbies, etc. You know, to make the gift making easier. The Sign up starts today (Nov. 16th, 2010) and it will be open for a week or so (Nov. 23rd). As mentioned, you can only sign up BEFORE the PM send out. Act fast before it is too late! Soon after the Sign up is over, I will send a PM to all the participants with their partner's name (the one you should be making a gift for). After that you will have until December 23rd to finish your gifts. Once you are done with it, PM me the gift. Don't forget to mention who your partner is, as it speeds up the process of organizing the whole thing. December 23rd - Last day to send in your gifts! If you have any questions feel free to PM me. What kind of gift should I make? 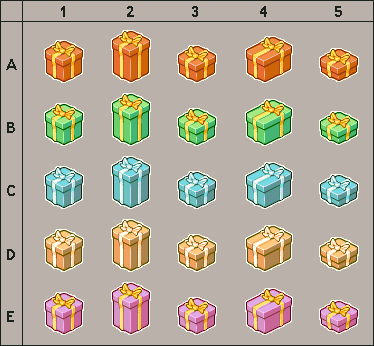 As mentioned, we will be dealing with "Pixel Gifts". Just pixel something for your partner. It can be anything really, an avatar, an animation, a mockup... whatever you think that could work. I will be away on December 23rd. Can I still participate? Sure. You can always send me the gift before the 23rd of December (which is, in my humble opinion, recommended). As long as you can send something before the due date is over, you are good to go. I couldn't finish my gift... Can I send a WIP? Yes, but you will still get a strike... and you must finish it as soon as you can. Or else! Can I make gifts for someone who is not my parter? Sure, but first focus on your partner. Once you are done, feel free to make gifts for anyone. All the gifts need to be wrapped (hyperlinked) in one of these wrappers. If there is any you'd like for you partner, simply mention it in your PM once you send me the gifts (just addresss to them as A2, B4, C1, etc). If you don't choose one, a random one will be assigned. Yes yes! Sign me up and count me in. I'd like something psychedelic this year, listen to this if you need an aide. Bonus points if you can work Carl Sagan in there. Any 'E' wrapping will be good for me. I wasn't going to mention stuff I don't want, but everyone else is so may as well. I like pastel sunsets, futuristic skylines, cute girls, slightly quirky things, and cool hair. Oh, I did this last year! Great fun, sign me up! I'm into High Fantasy, steampunk or cyberpunk, occasionally surrealism and romanticism, and appropriately saturated low-res stuff (like the PC version of Spelunky, for example). Count me in. Haven't done one of these before. -Comics,marvel/dc supers mostly, like The Flash(Modern though). I like presidents, serif fonts, yellow, ships, There Will Be Blood, death metal and reggae, naked ladies, where's waldo, ping pong, gorilla. But I'll be happy with anything. NES colors are pretty awesome too. I don't really like lo-fi things or cute things (with the exception of humans). I like vibrancy, the colors green, orange, blue, and most others, but especially green. Game mockups and melee combat, hands and eyes. "Healthy" girls, explosions, fantastical creatures. Animation. Ancient civilizations. Deep sea creatures. Science Fiction. -Scenes with lots of stuff going on and things that have an optimistic mood to them! -And hot girls of course! -Overuse of colors. Overuse of purple. -Anything creepy, unsettling, or unnatural. Since everyones listing songs for inspiration, then listen to the soundtrack of Katamari Damacy (Particularly Katamari on the Swing!) if you need help! And for the wrapping if I can, I also want to try to make my own wrapping type! If I can't then make it anything from row C.
Sorry if I seem demanding, just as long as you make something, I'm OK. I'll try to make the present I make as awesome as possible! I like retro futuristic astronaut stuff, mockups,small sprites, but anything is okay. I have been waiting a year and a half for this! Count me in! COLORS but thinking more object wise, I've always loved dragons, something unique would be cool. I am obsessed with fried chicken, I've had it for all 3 meals a few times. I'm not a fan of well obvious extremities, I'm still a youngin, so things like gore or anything is just too much. I generally don't like guns especially associated with hunting. And I really dislike dithering, unless it's a necessity I'd prefer no dithering. Anyway feel free to ignore everything I just said, I really don't mind surprises, and I love seeing an art free of restriction. If you need any ideas feel free to read above. I'm so excited for this! Heck yes first secret santa! I like cute/beautiful/original things, solitude, romantic landscapes, european/asian/african elements, interesting compositions, unique palettes (otherwise I love the primaries too). If you want to, listen to Akino Arai or Kings of Convenience. Not enough pixels in the world. I would like to sign up for secret santa please. I cant wait to give the gift of pixels! For my present this year, not any will do. I wish to get something thats yellow and blue. It may have more colors for you to employ. The more the merrier for all to enjoy! Isometric I'm craving so please do your best. Sim City and Xcom you all know the rest. My favorite of all is Transport Tycoon. just give it your best, and I'm sure I will swoon. One last thing to say, is I'm not really picky. Dont have to be iso, as long its not icky. So that should bout do, my holiday fren. Have a happy S.S. this Two Thousand Ten. I like large funny hats, imaginary flora & fauna, jars of pickled bell-peppers, nature spirits and that part of reality that lies outside of the scope of our senses. I'll probably do what I did last year and just hop in and pick someone's interests I like and maybe do a piece. I don't like the odds of me being banned, heh. like: robots, weird animals, insects, pretty much anything kinda weird and a perhaps a bit morbid. any package will be fine. Realistic looking dinosaurs trying to fit in and make end's meet in modern society. If that's not your cup of tea, I also love and appreciate a good animation, post-apocalyptic bartering, and REALLY SHINY things. I like action, mockups, animals, monsters, but I will appreciate anything that is made. This is my first secret santa year, I'm excited to make someone a gift! i like soccer, renaissance art, mythology, realism, hard rock/metal, anything with a deep meaning, humor, and generally anything that gives off a "historic" vibe! I like films and TV (Sci Fi and Horror). I've never done one of these, sign me up. I like, fantasy, horror, RPGs or whatever you can do best. I'm in! I like a lotta stuff so here's a list. If you need me to be more specific, I like really badass and beautiful things from nature, and trees, and insects. I like geometric shapes; animations; bright colors or dull colors, nothing in between; alternative rock; comedy; and motion graphics. i like: Me gusta! - Cyborg kurochan - Kungfu – Viewtiful Joe – Zelda Windwaker – Sharknife (comicbook). Sure, I'm in. This looks like a lot of fun to do, so long as whomever gets my gift doesn't care that I'm not too great at pixel art. I'm a bit rusty, but I really want to join I'll try my best. Count me in. I like small palletes with vibrante, bright colors. Maybe mockups, robots, nature, action and doesn't need to be realistic. Count me in! I missed out last year and I regretted it greatly! Could I make my own wrapping as well? Just saying, if you don't intend to make a gift, or finish it, just tell panda or someone else moderating our internet activities BEFORE it's too late and BEFORE you're hated and banned and whatnot. I'm in as usual. Been a while since I did any pixels. Might be nice to get the rust off. red is my green, but yellow is yellow. I like comics, funky colors, cool monsters, cool enviorments, beards, robots, mockups(snow! ), octopusses, humor...but i also like originality,if you come up with something awesome, then do that! Oh and mist I love misty moody pieces. -Thoughtful details that contribute without cluttering. THE SIGN UP IS OVER! No more participants allowed beyond this post. For those who signed up, I will be sending you a PM either later today or early tomorrow. Re: Secret Santa 2010 - The Sign up is OVER + All PMs sent! The partner you just got in your PM is the person you should be making a gift for. Do not miss the deadline! I triple checked, but if for some reason you signed up but didn't get a PM, just contact me. Why not list the stuff you like and someone might be nice enough to make you something even if you aren't officially signed up. Made some promising progress on my secret santa gift over the weekend. So fun! Two weeks left to make your gifts! Don't leave it for the last minute and start working on them if you haven't already. OH MAN OH MAN OH MAN!!!! been looking forward to this all year! count me in! likes: cute stuff, World of Warcraft, things that are of a epic nature. oh well... HAVE FUN GUYS!!! Hmm, I guess I know what I'm finishing 2moro.. lol. Heres hoping that everybody that has not submitted their gifts yet are making sure to give it that extra holiday polish. So Excited to see what everybody gets, and maybe equally excited to gaze upon Pandas Wrath! Mine should be finished by tomorrow or sunday. ...which roughly means forty-something of you stilll need to get working before your time is up and I go on a skull cracking spree. Just in the refining stages of my gift, double AA checking everything, etc. so you can count on mine being there. Don't create a sad panda, guys, don't leave your elves without gifts! Can I send two gifts? Sure, feel free to do so if you are up to it. Working hard on it, got it all planned out. Will be finished in time. recompense for the delayed gift..
dunno maybe a second gift or so..
You can send in WIPs if you can't finish your gift in time. You'll be getting a strike, but I guess better than a ban. Ultimately, what I'm trying to avoid by having all these punishments is people without gifts. It just seems like many people don't act unless something is on the line, and even then, year after year many people still don't deliver at the end. It's practically a christmas tradition that I don't finish my piece till the last day, I kinda bit off more than I could chew this year but hopefully the tradition is upheld. year after year many people still don't deliver at the end. Maybe the issue is that a month is too long a time; it seems like a lot of people forget/become disinterested etc... Perhaps Secret Santa should run for 2 weeks instead, that will give people less time to put it off. I hope everyone can finish in time It's a pity that participants are down from last year, there were 70-some and it's always great fun to look through all the loverly entries. what happens if mias or ptoing don't finish? Tomorrow is the LAST DAY to send in your gifts! Uhm... I guess it is something to consider. Perhaps next time I could set up a poll and have you guys choose. If hypothetically that were to happen, I'd ban them just like any other member. Well, I finished mine earlier today, but I'm not quite sure my message was sent. I know I sent it, but my outbox is empty. If I don't see anything to deter me (such as a message in my outbox or a note that the message was received), I'll probably re-send the message tomorrow. @FRAWG your outbox is empty because you didn't check the "Save a copy in my outbox" button. The way you can check if your message was sent is to check the list, if yours was gotten your name will have a santa next to it. EDIT: your name does have a santa next to it, so you don't need to re-send. FRAWG, I got your PM, so no need to resend it. As Clovvach has mentioned, if your name has a RoboSanta icon next to it (in this thread's first post) it means I got your gift and you are safe. Unlikely but just in case, if you've PM'd me but didn't get your name marked by the mentioned icon, just contact me. Alright, thanks for the help both of you! I can't wait to see what has been done this year, it's probably the most interesting gift I'll get this year. Besides the card I got from my friend, who else spends more than 30 minutes on a gift? The people here spend a lot of time on this, and it's a great accomplishment. Yay time constraints! I sent mine in. Kinda want to see Ptoing get banned, it'd be humorous. Uh...how long exactly is left? Uhmm, I'd say close to 24 hours left (from this post). I want to be fair to all the timezones, so I'll probably close the submitting once I get up tomorrow. Sent! Here goes leaving the flat in a presentable condition before heading for ze home and getting the christmas on! Thread updated! About a tiny bit more than half of the people submitted their gifts so far. TODAY IS THE LAST DAY TO SUBMIT YOUR GIFTS! Finish your gifts and send them my way before it is too late! Got mine in just in time. What time today? I'll prolly be cuttin' it close. I'll close it at around 12pm (noon) UTC+1. So, roughly 13~14 hours left. Sent mine in. I definitely want to go back and edit some places once this thing's over, but I'm just glad I made the deadline, I cut it really close! Looking forward to what's to come! If I counted properly, only 15 people are left. Not too bad I guess. yesss!!!... IM EXITEEEEEEEDDDD i want to see what ppl did! go ppl, gooooo!!!... sante should bring us happiness! Anybody else think there should be an official countdown page or something like that in the future? The timezone difference always gets me. Thanks to everyone who took part on this activity. Anyway, the gifts will be posted shortly (I need to triple check everything! ).